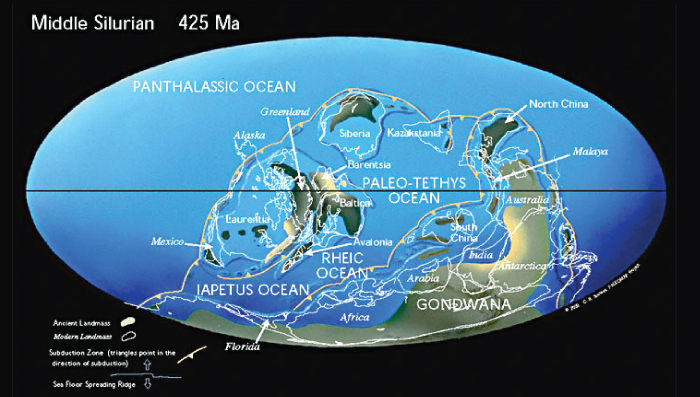 After the Proterozoic supercontinent Rodinia broke apart during the Early Paleozoic, the largest remaining coherent landmass was Gondwana in the southern hemisphere. Gondwana was composed of the present-day continents of India, Australia, Antarctica, Africa and South America. China, at this time, consisted of two separate and mostly submerged continental masses that lay in warm tropical waters off the coast of Gondwana. Shallow marine waters covered the entire region of China and abundant carbonate deposits were formed. The Yangtze Region of South China was the place in the Austral-Asian region where the Cambrian Explosion of Life occurred. The Panthalassic Ocean covered half the globe during the Ordovician and seas flooded across the continents that were part of western Gondwana including North and South China. Organic reefs were abundant in middle to tropical paleolatitudes. Sediments accumulated to form limestones and shales that are today best preserved in the Yangtze Gorges area in Hubei Province. These rocks contain the world's most complete marine fossil record of this period, including trilobites, nautiloids, and graptolites. 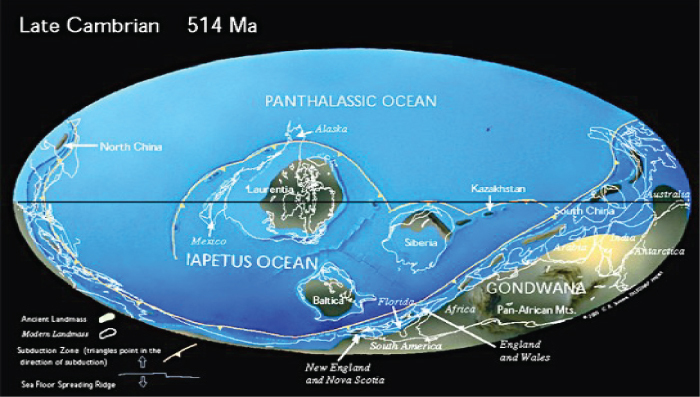 The collision of Baltica and North America caused the Caledonian mountain building and the closing of the northern branch of the ancient lapetus ocean while a new ocean Tethys began to form between Baltica and Gondwana.